During Dutch Design Week, designer Aniela Hoitink will present a new project made possible with financial support from Creative Industries Fund NL. This project is called Dynamic Skin and is inspired by topographies of the human body. Aniela Hoitink said “Use of technology in the fashion industry is, at present, limited predominantly to gadgets and accessories that monitor what the body is doing and allow the user to react. NEFFA feels that textile should respond to the user instead of the other way around. Innovation should create textiles that are much more alive, to reaffirm our connection with them. This can be achieved with textiles that respond to the wearer’s needs, for example actively providing protection or care without any conscious thought on the wearer’s part. This is the idea behind Dynamic Skin. When creating Dynamic Skin, NEFFA drew its inspiration from topographies of the human body and microbiome. In simple terms, Dynamic Skin collects and stores solar energy and uses that energy to generate warmth or light, forming its own metabolism. In the same way that the human body consumes food and uses that energy to power movement, Dynamic Skin collects and stores solar energy and uses it to generate warmth or light. NEFFA began by designing five ‘inspirational outfits’ inspired by the human microbiome, blood circulation, muscles, nervous system and bones. It then added further detail and development to those five concepts. Like the human skin, Dynamic Skin consists of layers. Energy is used based on the wearer’s heart rate and circulation. A monitor translates the wearer’s heart rate into a LED pattern that reflects the rate at which blood is flowing through the wearer’s body. Heating threads in the textile cause the clothes to change colour, giving visual expression to the blood circulation. While creating awareness of our bodies’ internal heating function, they also provide actual warmth. The colour pallet is inspired by the human body: different skin tones combine beautifully with the blue of veins and the red of blood. 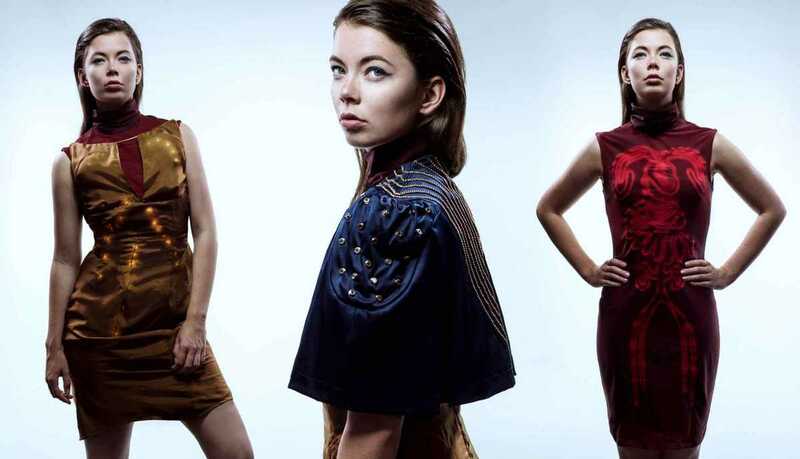 NEFFA has used these innovative textiles in its designs for a collection consisting of five ‘inspirational outfits’ and three ‘fashion tech garments’. The technology is an integral element, having been incorporated naturally and logically during the design phase. Rather than being the focus itself, the technology is merely a tool that serves exclusively to highlight the fashion design. The result is a set of clothes that are attractive to wear – a clear difference between NEFFA and the sci-fi and techno applications that, while showcasing the technological possibilities, completely ignore comfort and practical convenience. The development was funded by a grant from Creative Industries Fund NL, and was made possible by the kind assistance of Waag Society and AGA LAB. Next Next post: Can coworking ever work for creatives?